In existence since the school's opening in 1965, the Lakeside Viking Band fosters a long-lasting bond between the band program and the community by providing a quality product for our supportive base to enjoy. The Lakeside Viking Band has been in existence since the school’s opening in 1965. The list of past directors that have led the Viking Band include Kenneth Kraus, Richard Brock, Rick Bennett, Alan Cameron, Ron Volz, Kevin Jones and Antionio McPhearson. Since 2003, the band has been under the sole direction of Mr. David Fairchild. In that time, the band has ranged in size and has performed for many audiences, including President Richard Nixon and a Columbine High School shooting survivor. The Viking band has also performed in local parades and events, such as the opening of the Georgia Dome, the Inman Park Parade, DragonCon Parade, Spivey Hall Jazz Festival, Georgia Tech Band Day, and most recently in a joint concert with the Georgia State University Symphonic Winds, the Emory Wind Ensemble, and as an invited band at the Kennesaw State Concert invitational in 2011 and 2016. The band has also performed in concert with high school bands from Canada and hosts events from local radio stations like Clark Atlanta Radio, who held an event for the Lakeside Band for “Jazz in the Schools Month” in 2009. Lakeside has hosted artists and composers such as Peter Bond, Bruce Broughton, Freddy Martin, Sam Hazo, and Bucky Johnson, Michael Daugherty, and Aaron Perrine. 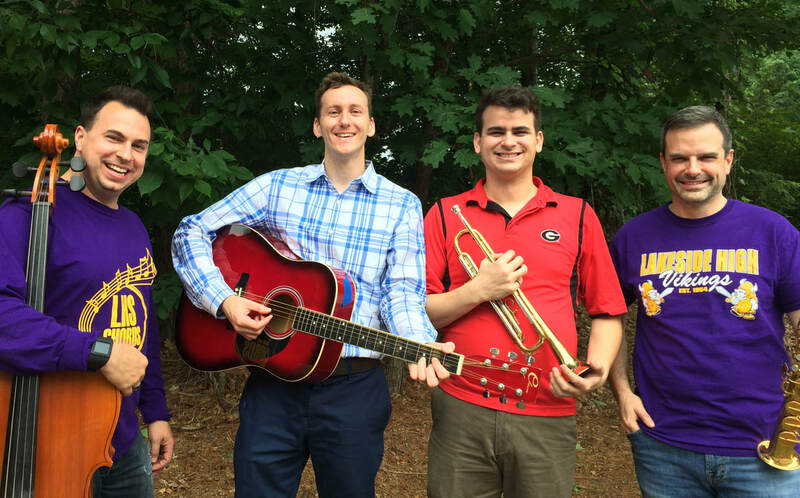 Situated in Northeast Atlanta, Lakeside’s Viking Band enjoys a culturally diverse student body. The school’s enrollment totals 2100, and students feed in from Henderson Middle School. The band has many future endeavors, and has experienced continued growth for the last ten years in all activities. Currently, the band has over 210 members. The band program offers many activities for student involvement. The Lakeside Marching Band began competitive performance in 2004 routinely places or wins its class in competitions. The Viking Jazz includes a big band and smaller jazz combos which perform for school and community events, and hosts an annual swing dance each spring. Classes that students can take during the seven-period school day include Symphonic I, Symphonic II, Purple Band, Gold Band, and Vibe! the Lakeside Percussion Ensemble. The concert bands have travelled to Washington D.C., Cocoa Beach, Myrtle Beach, Charleston, and Chicago, and takes a trip every four years to Hawaii to perform at the USS Missouri and USS Arizona memorials at Pearl Harbor. The Lakeside Viking Band also boasts an active Independent Winterguard and Winter Drumline, and the students from the Lakeside Band are regular members at UGA’s JanFest, DeKalb Honor Band, DYSO, MAYWE, ASYO, EYSO, AYWS, and the Georgia All-State Band. The program has recently moved into a beautiful multi-million dollar fine arts building. The Lakeside High School Band is dedicated to the development of our creative and technical abilities through determination, practice, and leadership. We foster a long-lasting bond between the band program and the community by providing a quality product for our supportive base to enjoy. We plan to enable each student with the skills necessary to achieve lifelong success in music and beyond.